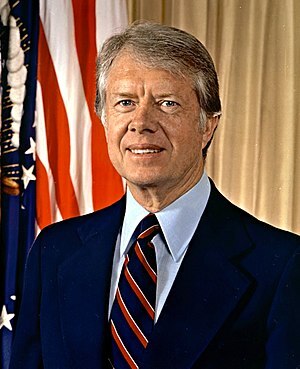 Who was the better president, Ronald Reagan or Jimmy Carter? Most people who lived through their presidencies would say Reagan and I tend to agree. Reagan uplifted the country while Carter did not. Reagan concentrated on the big picture and largely ignored the details while Carter immersed himself in minutiae and lost track of the big picture, in the opinion of some. I think that Barack Obama most resembles Reagan in concentrating on the big picture while uplifting the country. Mike Huckabee and others on the Right are criticizing the President on ignoring some details, but they would criticize him no matter what. Just can’t please some folks. This is the start of a regular feature that will continue as an Aside. I enjoy sharing bits of Presidential trivia. Thomas Jefferson preferred the written word over the spoken word. He gave only two speeches during his eight years as President, his first and second inaugural addresses. Teddy Roosevelt was a voracious reader and writer. He read all 47 of Anthony Trollope’s books in one year. Woodrow Wilson’s first name was Thomas. U. S. Grant’s first name was Samuel. When he applied to West Point, his first and second names were reversed and he never changed their order. Grant was a close friend of Mark Twain. LBJ earned the nickname Light Bulb Johnson by turning out the lights in the White House when not in use. JFK suffered migraine headaches if he did not have a sexual encounter every three to four days. Jimmy Carter immersed himself in the details of his office. He personally scheduled the use of the White House tennis courts. Dwight Eisenhower was noted for his sometimes convoluted speech. He did this on purpose to confuse his questioners in the press. Andrew Johnson was so highly regarded by the voters of his time that he was regarded as a second Andy Jackson. The baseball season is about to begin and I will root once again that the Cubs make it to the World Series. I have been a Cub fan since 1950 and my fantasy is that they win the championship before I die. Thinking of fantasies, my thoughts turned to what a GOP baseball team would be like if they played baseball instead of politics. The team name would of course be the Elephants and the owner the US Chamber of Commerce and the manager would be Grover Norquist. They would play in a new stadium each year financed 100% by the taxpayers. The stadium was formerly named BP Field, but BP sold the naming rights to Exxon Mobil to raise a quick $20 billion to fund the “slush” fund required by President Obama after the Gulf oil spill. The Elephants now play at home in Exxon Mobil Field. Now let’s select our players. On the mound is our star pitcher, John “Teardrops” Boehner, famed for his tear ball. Like a spit ball, but wetted by tears rather than spit. Behind the plate and calling the balls and strikes (the Elephants play without umpires) is Eric Cantor. He wears the catcher’s usual protective gear plus rubber gloves, a raincoat and hat and goggles when he is catching John’s tear ball. On third base and keeping the official score wearing an accountant’s green eyeshade is Paul Ryan. The rest of the infield is composed of the Elephants’ famed double play combination. Not yet as famous as Tinkers to Evers to Chance, they are Ignorance at shortstop, Apathy on second and Inertia on first base. These three are who keep the GOP Elephants in close games. Additionally, if the Elephants fall behind in the score, Paul just stops counting the runs the other side scores. The Elephants have an unusual and especially weak outfield defensively. In far right field hugging the foul line is Michele Bachmann. Playing center and most of right field is Willard “Moss” Romney. Known as Mitt Romney off the diamond for his golden glove and golden bank account, he was given the nickname “Moss”, short for a rolling stone gathers no moss, for his constant movement in the outfield, changing positions at the drop of a hat or a change in the wind direction. The Elephants also field a second center fielder because no one will play left field. That leaves a huge gap that other teams can exploit. The Elephants are the only team in baseball with no left hand batters or pitchers. The Elephants plan to use the 2011 season to prepare for the important 2012 season. I am particularly looking forward to the 2012 series scheduled to end on the first Tuesday of November, 2012. If the Elephants survive the next two years, we will believe that miracles do happen, even in fantasy baseball. On the mound is their ace left-hander, Barack “No Drama” Obama. Behind the plate is their catcher, Joe Biden. On third is their main numbers man, Tim Geithner. The heart of the Donkeys’s defense is their double play combination of the 3 Cs, Bill Clinton as shortstop, Hillary Clinton on second base and Jimmy Carter on first. In the outfield, there is Dennis Kucinich in left, Bernie sanders in center and Al Gore in right who bats fourth in the clean up position. The Donkeys wear an all green uniform and are nicknamed the Green Team. Their manager is Howard Dean. Their farm system includes two teams, the Washington Senators and the Baltimore Ballots. The Donkeys, unlike the Elephants, are known as a team of much internal dissension.